We report on the banded polymer morphology of several semicrystalline commodity polymers such as high-density poly(ethylene), poly(trimethylene terephthalate), poly(vinylidene fluoride), and poly(3-hydroxybutyrate). 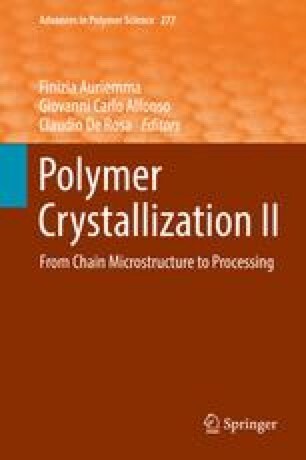 The internal structural organization and 3D shape of the constitutive crystalline lamellae have been topics of interest in polymer physics for the last 50 years. However, conventional morphological characterization techniques (electron and/or optical microscopy) can be misleading in such analyses and have resulted in wrong interpretations of the twisted lamella growth mechanisms. We present nanofocus synchrotron X-ray scattering experiments and describe the analysis used to interpret the arrays of nanodiffractograms acquired along the spherulitic radii. It is shown that the crystal twist occurring during radial outward growth is regular and uniform. The 3D lamella shape is in most cases similar to the classic helicoid, whereas in other cases, such as the lamellae of poly(propylene adipate), it corresponds to a spiral structure. Access to comprehensive microstructural information about bulk samples makes it possible to better understand the twisted growth mechanisms and check the premises of the Keith and Padden model linking the direction of chain tilt and lamella twist hand. It is demonstrated that this model cannot explain the banding behavior in poly(trimethylene terephthalate) and therefore needs reconsideration. In-depth analysis of the microstructure allows more general conclusions to be drawn regarding correlation of chiralities pertinent to different spatial scales, ranging from that of the constitutive monomer to the supramolecular level of twisted lamellae. The authors thank the Ministry of Education and Science of the Russian Federation (contract № 14.604.21.0079 (RFMEFI60414X0079) of 30 June 2014. The authors acknowledge Manfred Burghammer from the ID13 beamline of the ESRF for excellent technical support and valuable discussions, and thank Bernard Lotz for donation of the Sclair sample.